I plan to start on this feature soon. Really liking the way it will make the constantly improving UI feel, and should make a lot of users happy. We are nearing a stage where 1 or 2 features of this size can be worked in without breaking SR too much. It would be great if there was a way to download the higher quality show when it did become available automatically. I have manually put some of my shows down, just to get the episodes, but I would still like to get them in better quality if they become available. This. I always prefer HD where I can get it. However there's a few shows that very rarely post in HD. I'd like to have these more or less be run as 'grab the first thing that becomes available with no care for quality or release group, upgrade to HD later if it becomes available'. Sounds like it would be very similar to proper searches actually. I think handling this sorta how CouchPotato does would be good, if you are not familar with it it pulls a list of torrents it "thinks" is the closest match to what you are looking for and you can then choose which one you want. So, any news about this? Or any other feature for that matter. Would be nice to be able to see what you are working on right now, maybe some time schedule somewhere that shows when you plan to start working on different improvements. Would have really needed this today. I had set up The Big Bang Theory to get auto downloaded on 720p HDTV. It downloaded a version that for some reason had 0 seeders and 400 leechers and has been like that for several hours now. I tried deleting the torrent and manually set the status to Wanted, but it tried to download the same torrent again even though there were other torrents with the same quality available. If I had just been able to manually search I could've told SickRage to download another version instead. But still, automation works great in a perfect world. Unfortunately we don't live in a perfect world. 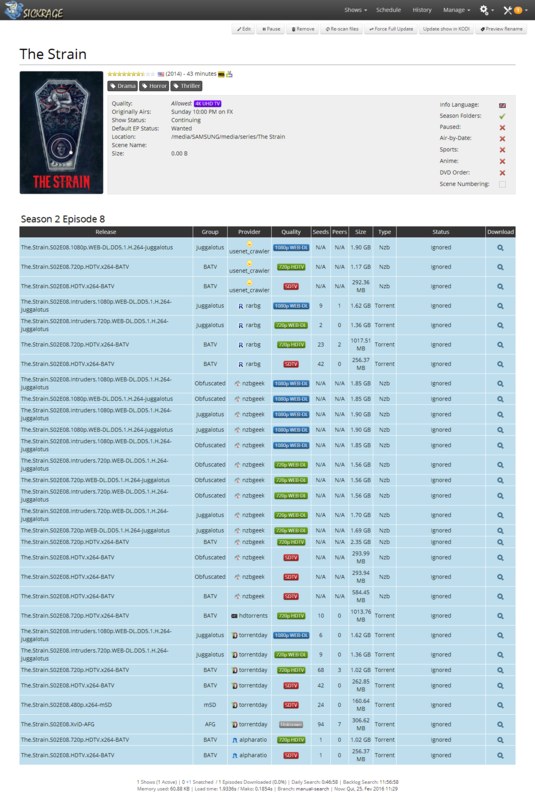 Here's one example why we should be able to choose what to download: Today, I tried to add Danish hit series "Forbrydelsen" (The Killing) to SickRage through the "Add a Show" feature. The interface could find and add the show. However, as it automatically changed the show's name to "The Killing" and searched it on torrent sites that way, it downloaded the utter crap American nonsense named "The Killing" adapted from the Danish original. Also it failed to find the Swedish series "Bron/Broen" because it automatically changed the name to "The Bridge." This is annoying. We need this feature. Urgently. Once again I encountered a situation where Manual Search would help me alot. Pretty Little Liars had a special episode today, but SickRage can't find it even though it's there. If I could just press a "search" button in SickRage and it would bring me the latest episodes uploaded to my providers it would help me alot, especially when working on a phone. Also, this if getting quite ridiculous with this FeatHub. It's been live for over 2 months now, this feature has been number one from day one. Only 20 cases has been closed and you got 264 open. Don't get me wrong, you guys do a wonderful job and put a lot of your free time to ease our lives. But we get no info (that I could find anyway) about what you do and what you work on. For example, why has your number 1 requested feature not been implemented after 2 months? I'm sure there is a reasonable explanation to it. I'm just so tired of going into this request hoping to see an update from a developer. This seems like a huge adder based on how folks want it to work, so not surprising that it is taking a while to implement. Sonarr has this ability and it was one of the things I thought was really cool when I was testing it out...but SR is better at a lot of other things in my opinion. Adding this feature would be a huge upgrade and therefore has my vote! I spoke with in IRC , thats why i'm responding here also. I have this setup > serie > required words : LOL,DIMENSION I use opensubtitle for sub seeker. I'm a little in doubt on how users would see this implemented? Like using a text input and to enter a search query? That would go through all your configured providers and use that search query, give back all torrents/nzb results, for which you can select an start downloading? Because that's not entirely how sickrage works. As we only search for indexed shows. I could image an additional step is build in, for when you click a button for a specific episode, it navigates you to a page with all the results. Ignoring qualities and other automatic filters. Where you then can click a download button. Also for the original feature request by hennigs, there are already solutions for the use-cases he described? implementation should show all search results for a specific show including file size, sourcetype, source, etc. and an interface where you can check all sources you want the downloaders to download. Deadliest Catch, S12E04 title is "Sweedish Twins" Well "sweetish" is an ignored word ( I fixed that now) but it would not download and only gave the error of "a release not wanted" thats it. I figured it out but still. Keeping the automated system is fine, but clicking the search from the shows page, would then trigger the override and present another screen such as Adaur's suggestion. Or atlas give an "override keywords/quality" box. TBH this kinda stupid, Sonarr has this and SR doesnt? I don't want to go through a 3rd party build just for such a simple feature :( & @miigotu 2 years past? still need more time?